When I was eleven, my grandmother took me took on a Mediterranean cruise. At that age, I was filled with the wonder and the eagerness of youth, but I was also old enough that I remember it quite vividly. I still have my trip diary with tireless records of my impressions of everything. Of course, this was way back in the olden days before Internet when the only entertainment on board was cards so I had plenty of time to write. My own daughter is the same age now, and I decided that was time to take her on the same trip. I wanted to visit France and Italy and if time permitted, I also wanted to see Croatia and Greece. Our Poshbrood included my husband, Jack, my step-daughter, age 24, my step-son and his friend, age 20, and my daughter, age 11. This was a wide range of ages so we would need a ship with amenities for kids, teens and adults. Of all of the cruise lines in the world, Royal Caribbean is the only upscale one that offers a wide range of activities for all of these age groups. A fabulous Royal Caribbean travel consultant helped me choose the cruise, make the reservation and work through the stateroom situation. For the six of us, we decided on two suites with balconies. I urged everyone to pack lightly because ships often have scant closet space. I, then, took three giant bags. But as our stateroom had twenty-three drawers and three large closets, my chronic over packing problem proved a non-issue. It was roomy, clean and a posh home for seven nights. We embarked the ship in Barcelona and set sail for France. The beauty of a cruise ship is that you are not constantly packing and unpacking and your commute is one of the pleasures of your vacation. On our first and last nights at sea, my husband and I had massages. On each other evening, upon boarding the ship after a day in port, we all headed to the fitness center. I ran a few miles on the treadmill, over-looking the bow of the ship and the Mediterranean Sea. This was followed by a workout with Jessica, a blonde South African trainer. She was extremely tough but somehow the delightful South African accent kept me going. We did free weights, a super-fun boxing workout, abs and stretching. A quick shower and we were off to dinner, either in the dining room or in one of the specialty restaurants, Chops or Portofino. I found that we preferred the specialty restaurants as we could dine later than our 7 pm seating in the main dining room to which we were assigned. Believe it or not -- Between the exercise on and off the ship and the availability of healthy meals, I lost eight pounds on the trip. Royal Caribbean should promote a specific spa vacation package (though it is a shame to miss out on the Ben and Jerry’s on Level Five and the Johnny Rocket’s on Level Eleven). After dinner, the kids were free to roam to the ship. There are so many kid/teen amenities and activities onboard: an arcade, a teen club, a disco, a rock climbing wall, miniature golf, a basketball court and a “Flow Rider” which is a surfing simulator that sends a thin sheet of water up a sloped and cushioned platform. There was something very comforting knowing that my (underage) kids were “out” enjoying themselves “in Europe” but they were actually in a contained space and they were doing safe but fun activities. I want them to see the world but it is a dangerous place and if I can create safety zones in which they can do so, I will. Our shore excursions were, without exception, sensational. Prior to our departure, I contacted Private Shore Trips. They work with a variety of independent tour operators throughout Europe and the Middle East and they arranged driver/tour guides for us at three of our ports. Our driver took us on a scenic drive along the coast of Toulon and through Saint Mandrier-sur Mer where Coco Chanel once had a summer home, after which we headed to the top of Mont Faron. It is a mountain overlooking the city of Toulon with the sea stretching endlessly before us. We had lunch and walked around a small fishing village in Cassis. Between Marseille and Cassis, the coast is broken up by Calanques—they are steep, vertical, white cliffs which appear to dive into the deep blue waters. We spent our time navigating through these fjords in the small boat, passing groups of French sunbathers who looked as if they were plucked right of the classic film noir, La Dolce Vita. Our next port was Nice. Royal Caribbean had eleven shore excursions planned including visits to Nice, Eze, Monaco, Monte Carlo, Cannes, and Grande Corniche. I had a full day planned including almost all of these stops with our guide, Catherine. Our first stop was the Cours Selaya, the Old Town of Nice which serves as a flower and produce market on all days but Mondays, when it becomes an antiques market. Catherine met back up with us for the beautiful drive along the coast to Eze Village and on to Monaco and Monte Carlo. After driving for about thirty minutes, we arrived at Eze, a medieval village almost 1500 feet above seal level. It is touristy but as we are tourists, we thoroughly enjoyed the shops and magnificent views. Fragonard has a store at the foot of Eze with heavenly perfumes, soaps and linens and as French soap may be the only thing cheaper in France, I wish that I had bought more. It was time to get back in the bus but for the first time EVER we never heard the standard backseat question: “When are we going to be there?” No one asked because the views along the way were so magnificent. Before we knew it, we were in Monaco and spent a wonderful day sightseeing. Back at the ship we were exhausted, but the ship’s activities’ gave us all a second wind. The fitness center was waiting for the boys and me, the spa for my husband, the arcade and pool for the girls, followed by dinner of Halibut and Filet at Chops for everyone and a few too many rounds of blackjack at the casino later for the adults while the kids listened to DJ Rolando on the pool deck while drinking Virgin Daiquiris and Mudslides. And I wanted to fit it all in by midnight because I love sleeping on a ship. I'm not a great sleeper and slept like a baby on an Ambien-Nyquil overdose on the Liberty of the Seas. After another of the best sleeps of my life, I awoke in a new country. Italy. The ship docked in Livorno. As both Rome and Pisa are close, Royal Caribbean had twelve possible explorations including visits to both cities with tours of the Field of Miracles and the Leaning Tower of Pisa, a historical tour of Florence, a wine tasting in Tuscany and a beach trip to Viareggio. Our guide, Rafielli, was waiting for us at the dock in Livorno. He was every bit as charming as his name. He kept us entertained during the one-hour drive into Florence with stories of skiing in the Dolomites (now on my bucket list), his large Italian family, his grandfather’s lemon farm and interesting facts about the Umbrian countryside. And he mentioned that his grandfather needs help on his farm. Just FYI, ladies. Next up was a forty-five minute drive to Pisa. The kids were so beside themselves with excitement about the Leaning Tower that I could not help but wonder if there had been a Simpson’s episode about it. When we got to Pisa, Rafielli warned us to watch out for gypsies and pick pockets. I zipped up my tote bag and we set across the Field of Miracles. There were probably fifty different people posing as if they were trying to hold up the tower while someone took their picture. The following day, Royal Caribbean had thirteen shore explorations and most of them involved day trips to Rome. As it was a two-hour drive and there is so much to see for one day, we decided to save that city for another trip. I decided on Royal Caribbean’s half-day bike trip including a tour of a gelato restaurant in Medieval Tarquinia. We boarded a motor coach for a thirty-minute drive to the small town where there were bikes, helmets and cold water awaiting us. We jumped on the bikes and rode through the town, on hilly cobblestone streets, stopping at scenic points, to tour the town hall or to look at an Etruscan ruin. The bike ride lasted about two hours until we were tired, thirsty and ready for gelato. We all went back to the ship where the kids had scheduled Flow Rider lessons for after dinner. This was located at the top aft deck of the ship. With a forty foot wave simulator, the kids had personal one on one surfing lessons and there was a bar and stadium seating for parents to watch. It was great fun watching them wipe out and tremendously rewarding when they all managed to get up on their boards. The great music (everything from the Police to Katy Perry) blasting in the background surely served as some inspiration. Wicked fun. Every morning, on the ship, I went to the Seattle Coffee shop for my latte. By day two, Virgilio, the barista knew both my name and coffee order. There were over 3,500 passengers. Menino, the bartender, knew all our names by day three. It did not seem as if the crew was just doing their job, it seemed as if they really, truly, enjoyed helping everyone. They were all just so incredibly pleasant. I actually miss them. Virgilio, Adrian and Giselle and everyone else: if you are reading this, thanks for everything! The next day, we arrived in Naples, our last day in port. 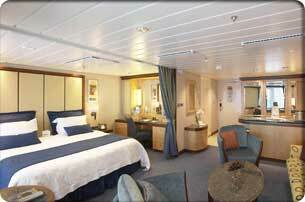 Royal Caribbean offered thirteen different shore explorations -- trips to Capri, Sorrento, Mt. Vesuvius, Pompeii, as well as pizza making and wine tasting excursions. After several emails with Rebecca Brooks of Capritime Tours, we had planned a speedboat charter with a guide around the island of Capri. A driver met us at the terminal and transferred us to the private docking harbor. We were met by Francesco, our friendly and tremendously informative guide, on the fabulous Capritime speedboat. The boat had a large deck covered entirely with big blue cushions for lounging and a separate, covered seating area.The kids immediately stripped down to bathing suits and spread out on the cushions for the ride to Capri. The color of the water is an almost indescribable beauty, an iridescent blue caused by the reflection of the sunlight that penetrates through a large opening beneath the water and onto the cave walls. We got to the famous Faraglioni rocks, took some amazing pictures and Francesco told us that you are supposed to kiss and make a wish. I generally don’t believe that kind of superstitious stuff but I kissed my husband, all right, because if you don’t feel like kissing your husband in Capri, you are in trouble, baby. Francesco chose two wonderful places at which we stopped to swim. We dove off the boat, snorkeled and swam in and out of caves. We went to Capri for lunch and then must have walked four or five miles around the island. We wove in and out of residential neighborhoods traversing narrow walkways while almost never losing sight of the Mediterranean Sea. Royal Caribbean Mediterranean cruises can start at $2500 for a family of four for an interior room on a Freedom Class ship like Liberty of the Seas. (Depending on time of year, specials, avail) Your best bet is to book through a travel agent to ensure lowest rate, best room, and schedule activities for your family. Contact Poshbrood/SmartFlyer to book at travel@poshbrood.com. --Submitted by Susanna Quinn, writer, mom, stepmom, wife, traveler, Louboutin lover, shopper and Poshbrood contributor.